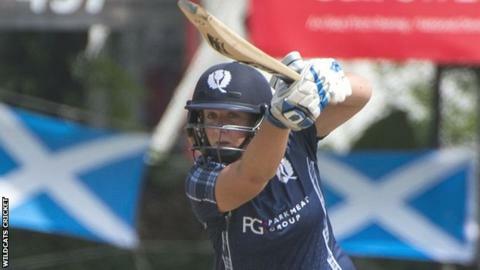 Scotland lost their opening ICC Women's World Cup Qualifier match to South Africa in Colombo by six wickets. The Wildcats set South Africa a target of 143 to win with Kari Anderson top-scoring with 50 before being bowled. Shabnim Ismail took 3-30 while three Scots were run out as they were bowled out for 142 from their 50 overs. Chloe Tryon, with an unbeaten 45, led number one seeds South Africa to their target for the loss of four wickets as they claimed their second Group B win. Kirstie Gordon took 2-39 from her 10 overs at Colombo's Mercantile Cricket Association Ground, with Katie McGill and Abbi Aitken grabbing a wicket apiece. South Africa next play Bangladesh, who are also Scotland's next opponents on Friday. In Wednesday's other Group B game, Pakistan beat Bangladesh by 67 runs, while in Group A, Ireland were thrashed by Sri Lanka, and India won a low-scoring game after bowling Thailand out for 55. The top three teams in each group progress to the Super Six stage, from which the top four qualify for the World Cup, which takes place in England this summer.